This is a continuation of our exercises to teach your dog to accept restraint and prevent aggressive responses. When I think of this exercise, I remember a dog in my obedience classes who had a problem with this. Buffy was a difficult-to-handle Cocker Spaniel who was being trained by a 13-year-old girl. Buffy's ears were not kept clean, in spite of a Cocker's predisposition to ear problems because he struggled so much when he was restrained. Partway through the class, he developed a severe ear infection. A trip to the veterinarian resulted in a major battle in order to examine Buffy. Putting in the necessary daily eardrops was next to impossible, which prolonged the infection. After his ears finally cleared up, Buffy returned to class. When his owner reached down to pet his head, Buffy bit her, badly frightening her. A reluctance to be restrained had progressed to aggression. All this could have been prevented with training. To clean your dog's ears, use a cotton ball or a tissue wrapped around your finger. 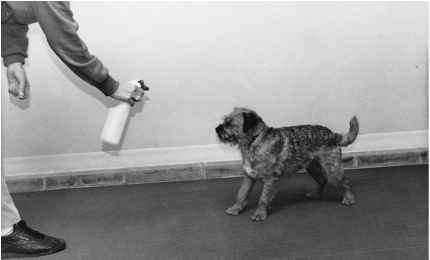 Use a cleanser designed especially for a dog's ears that you can purchase at a pet supply store, from a catalog, or at your veterinarian's. It should be just for cleansing and not be medicated. I like the convenience of ear wipes, which are premoistened pads. You will be safe from reaching the ear drum if you remember to keep your dog's ears pulled straight up as you clean them. Of course, check with your veterinarian if you notice an odor or discharge, or if you need a demonstration of ear cleaning technique. If you encounter problems with this, start by just handling your dog's ear and putting your finger in his ear. Be stubborn in insisting he stay sitting. Reward when you are successful. Then try just touching his head with the moistened cotton ball or gauze. Some dogs will be frightened by the smell. Work at just touching your dog's head until he is comfortable with it. Then move on to cleaning his ear. Remember Buffy, and don't give up. Your dog should also allow his teeth to be examined. As dogs are living to an older age with better veterinary care, they have more dental problems. To examine your dog's teeth, start by putting him on a sit-stay. Then close his mouth and gently lift his upper lip up and back. Check the health of his gums as well as his teeth. He should not break his sit-stay.